Information and links to suppliers of decoys, hides and calls. Pigeon shooting is our speciality and we offer a wide variety of pigeon decoys and pigeon decoying equipment to cater for all your pigeon shooting requirements. The original mail order fieldsports and woodpigeon shooting specialists, Decoying UK offer an impressive range of pigeon shooting, decoying and field sports equipment. 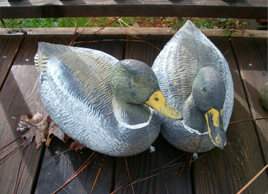 Stock duck and goose decoys imported from the USA and Europe along with accessories such as motherlines, clips, weights, calls, ready made hides and American style blinds. An extensive product range including pigeon flappers, rotary decoy machines, remote control flappers, Stealth camo nets, hide poles, flocked shell and full body pigeon decoys. A leading manufacturer of quality pigeon shooting equipment including flocked decoys, the Advantage rotary system, the Advantage flapper, camouflage nets, hide poles and more.